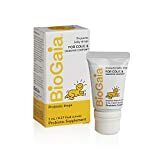 BioGaia Probiotics Drops is a specially formulated supplement designed for infants experiencing symptoms which are typically identified as colic or other recurring digestive system upset. Probiotic supplements for infants are easily dispensed through the use of liquid drops which can be added to formula, juice or breast milk. BioGaia Probiotics drops work to balance the infant gut flora, allowing for a natural ratio of good (healthy) to bad (unhealthy) bacteria. The use of probiotics in babies has been shown to reduce crying time and to ease other common infant digestive issues, like gas, which contribute to general discomfort and infant fussiness. BioGaia Probiotics Drops also contains 400 IUs of vitamin D3, which plays a role in bone health. Most children do not get enough of this vitamin from their diet. Probiotic bacteria are those microorganisms which, when administered in adequate amounts, confer a positive benefit to their host. Biogaia Probiotics Drops are produced with sufficient quantities of a patented probiotic strain designed to help babies and young children who are experiencing digestive discomfort. Biogaia uses their own patented strain of Lactobacillus reuteri bacteria known as L. reuteri protectis. Originally developed in Sweden by two scientists doing research on the effects probiotics may have on HIV, they inadvertently found many other positive effects with Lactobacillus reuteri. Eventually, the research director of Biogaia was able to locate and isolate a strain of the bacteria from the breast milk of women who live in the Peruvian Andes. This strain is still used in BioGaia’s probiotic products all over the world. Lactobacillus reuteri protectis is well studied and documented with regards to its benefits for colicky infants. In particular, crying time has been shown to be reduced by half in over 80% of the infants tested. The effects of probiotics can vary from person to person, but, in general, each species and strain appears to have uniquely different benefits. The effects of L. reuteri (the species of probiotic used in BioGaia’s infant drops) are well supported through double-blind, placebo-controlled studies. In particular, Lactobacillus reuteri protectis has been shown to ease symptoms associated with colic, constipation and regurgitation in infants. Other studies suggest the spread of contagious diarrhea in day-care settings can be reduced through the administration of this friendly bacterium. Colic: Recent research demonstrates a reduction in symptoms associated with colic in babies. A study published in the JAMA Pediatrics online publication in January of 2014 enlisted over 450 infants. During the course of the study, half of the newborn infants received placebo drops while the other half received drops containing Lactobacillus reuteri protectis once daily for a period of 90 days. After only 30 days, the group of babies receiving the probiotic drops cried less than half as long each day when compared to the babies receiving the placebo. After 90 days, crying time of the infants receiving probiotic drops remained significant in comparison to the placebo group, with over 40% reduction in crying time. Researchers also noted that the probiotics group had 30% more bowel movements each day and less regurgitation, suggesting better gut motility due to change in the gut microflora balance. Diarrhea and Respiratory Illness in the Child Care Setting: Another recently published study in March, 2014 demonstrates that administration of Lactobacillus reuteri protectis drops to children in daycare settings can result in a significant reduction in episodes and duration of diarrhea and respiratory tract infections. Over 300 children ranging in age from 6-months to 3-years of age were divided evenly into placebo and non-placebo groups. They were given Lactobacillus reuteri protectis probiotic drops for a 12-week period, followed by a 12-week period without any drops. The group receiving the probiotic drops experienced less than half the episodes and duration of diarrhea as their counterparts receiving the placebo. An almost identical outcome was reported with regards to respiratory illness. Biogaia Probiotics Drops are administered once daily in 5-drop doses. Each dose contains 100 million CFU (colony forming units) of L. reuteri protectis probiotic bacteria. If ordering directly from the manufacturer, this product may arrive in a temperature controlled container, but the drops do not need to be kept refrigerated. Instead, the manufacturer states they must be kept in an environment below 77 degrees Fahrenheit for the bacteria to remain viable. In many households, this makes the drops a shelf-stable supplement. The manufacturer ships in temperature controlled packaging to protect the fragile bacteria from unstable and undetermined temperatures during the shipping process. This product has been shown to be safe for a majority of infants though it is always recommended to check with your pediatrician before starting your infant on any new health regimen. Probiotics are considered generally safe for both babies and children. Lactobacillus reuteri protectis is a well documented strain of probiotic bacteria which has been consistently shown to provide health benefits to colicky infants, when administered as directed by the manufacturer. You can buy Biogaia Probiotic Drops online or from specialty health stores in your local area. Hola Marisol, la dosis recomendada es igual para bebés como para adultos, son 5 gotas una vez al día y la puedes mezclar con lo que quieras leche materna, de fórmula o cualquier otro líquido. Buenos días, por cuánto tiempo se debe dar las 5 gotitas diarias y en caso de mi bebé q a los 4 meses le di por 15 días las 5 gotas y ahora tiene casi 8 meses, quisiera volver a darle y mi hijo tiene 8 años también hace 8 meses también le suministre por una semana podría volver a suministrarle?. Hola mi bebé tiene 10 dias de nacida y la doctora le recetó el medicamento por 5 dias despues de un examen de heces que salio negativo aun asi le receto porque veia mucosidad en sus deposiciones voy en el 4to dia de tratamiento y ha empeorado ahora hace aguado y su pancita gruñe como tractor :( me preocupa que se pueda deshidratar. Mañana termina el tratamiento la llevare al pediatra otra vez.